I’ll start today’s post by citing a few numbers that some might find quite amazing. Do a search for “Amelia Earhart” on Amazon.com, and you will receive exactly 2,208 results, as of Dec. 23, 2014. This doesn’t mean that all 2,208 books are written solely about Amelia Earhart. She might only be prominently mentioned in many, but it’s certain that many hundreds, if not well over 1,000 of these books, are indeed written about Amelia Earhart, a true American original and one of our greatest all-time citizens. We should also note that well over 99 percent of the Earhart books on Amazon are biographies, novels or fictional works based loosely on her remarkable life. Less than a dozen of these 2,186 books actually attempt to explain Amelia’s disappearance, and only a handful are written and presented in a professional way. Regular readers of this blog are familiar with these books, so I won’t name them here. But if you do the same search on Amazon for Fred Noonan, Amelia’s navigator during their world-flight attempt up to and including their unsuccessful Lae-to-Howland leg, you’ll find just 142 results on Amazon. Of these books, none were written solely about him. I repeat: Not one single biography has ever been written about Fred Noonan. Fred Noonan, circa mid-1930s, in his Pan Am uniform. In March 1935 he was the navigator on the first Pan Am Sikorsky S-42 clipper at San Francisco Bay in California. The following month he navigated the historic round-trip China Clipper flight between San Francisco, California and Honolulu, Hawaii piloted by Ed Musick (who was featured on the cover of Time magazine that year). Surely, if only based on his brief professional relationship with Amelia, he deserved at least one biography. But when you consider his extremely impressive accomplishments as a mariner and later as one of the world’s most accomplished navigators, you can come to only one sad conclusion: History has treated Fred Noonan very badly. His seafaring life began sometime in his mid-to late-teen years; maritime records indicate that he was an ordinary seaman on the British barque Hecla, probably bound for South America, sometime before 1910, when we know he was an able-bodied seaman aboard the ill-fated British bark Crompton, which wrecked off the southwest Irish coast in November 1910. 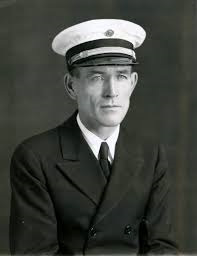 He continued working in the Merchant Marine throughout World War I. Serving as an officer on ammunition ships, his wartime service is reputed to have included billets on three vessels that were sunk from under him by U-boats, though in my online searchers I’ve found nothing detailing these incidents. A twist of fate saved Noonan from likely losing his life aboard the British cargo ship SS Cairnhill in 1917, when he missed the ship departure after being on board for just two days. Cairnhill was “captured and scuttled by U55 (Underwater Boat 55) when 160 miles NW of Fastnet on passage New York for Le Havre, sunk by bombs and her captain was taken as a prisoner,” according to one source. During his 22-year maritime career as a merchant sailor and officer, he sailed around Cape Horn seven times (three times under sail) and earned a master’s license for oceangoing ships of unlimited tonnage, as well as a license as a Mississippi River pilot, but again, no evidence can be found that he ever piloted a Mississippi riverboat. Noonan married Josephine Sullivan in 1927 at Jackson, Mississippi. After a honeymoon in Cuba, they settled in New Orleans. Noonan was 34 years old, Josephine, 26. 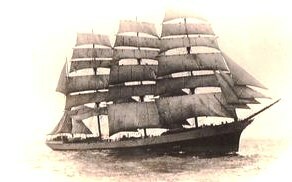 A rare photo taken from the “Original Real Photo Postcard” of the Four-Masted Barque Crompton, in which Fred Noonan, at 17, shipped out as an ordinary seaman, very early in his remarkable career. Crompton was launched in July 1890, in Liverpool,, and on Nov. 23, 1910, Crompton wrecked on a voyage from Tacoma, Wash., to Limerick at Puffin Island, Portmagee, on the southwest coast of Ireland. It’s probable Noonan was aboard Crompton at the time., though we can’t be certain in the absence of definitive records. By the late 1920s Noonan began looking skyward, and he earned a “limited commercial pilot’s license” in 1930, on which he listed his occupation as “aviator.” During the early 1930s, he worked for Pan American World Airways as a navigation instructor in Miami and an airport manager in Port-au-Prince, Haiti, eventually assuming the duties of inspector for all of the company’s airports. In March 1935, Noonan was the navigator on the first Pan Am Sikorsky S-42 clipper at San Francisco Bay. In April he navigated the historic round-trip China Clipper flight between San Francisco and Honolulu piloted by Ed Musick (who was featured on the cover of Time magazine that year). Noonan was subsequently responsible for mapping Pan Am’s clipper routes across the Pacific Ocean, participating in many flights to Midway Island, Wake Island, Guam, the Philippines and Hong Kong. In addition to more modern navigational tools, Noonan as a licensed sea captain was known for carrying a ship’s sextant on these flights. At some point toward the end of 1936, Noonan lost his job with Pan Am, and in in March 1937 he divorced his wife, Josie, in Mexico; two weeks later he married Mary Beatrice Martinelli (nee Passadori) of Oakland, Calif. After Amelia’s Luke Field accident on March 20, Harry Manning, her first choice as navigator, opted out of the world flight entirely, leaving the navigator’s job wide open for Noonan. 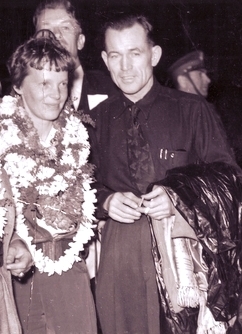 Amelia Earhart and Fred Noonan in Hawaii, on the eve of their ill-fated takeoff from Luke Field on March 20, 1937. Fred Noonan was a respected and accomplished professional, but as a condition of his agreement with the publicity obsessed George Putnam, he kept an extremely low profile during the world flight, never spoke on the radio and was rarely featured in the press. Thus his lasting notoriety in the Earhart saga has been the lingering question of his drinking, and whether it might have adversely affected the final flight. A few more details on Noonan’s career can be found elsewhere, but henceforth we’ll focus on the question of his alleged drinking problem and whether it might have affected his performance during the final flight, which, unfortunately, has been his lasting legacy. We’ll next hear from a few notables who actually knew Fred Noonan, and foremost among these must be former Navy Capt. Almon Gray, who was a Navy Reserve lieutenant when World War II was declared and retired in 1968 as Chief of Future Plans in the National Communications System. During the mid-1930s, Gray helped build the bases to support the first Pan Am trans-Pacific air service and was first officer-in-charge of the PAA radio station on Wake Island. After the San Francisco/Hong Kong air route was opened in late 1935, Gray was a radio officer in the China Clipper and her sister flying boats. Later he was assistant superintendent of communications for PAA’s Pacific Division. He flew many trips with Fred Noonan and got to know him well. He even consulted with Amelia, offering her the full resources of the Pan American radio facilities, then in position in the Pacific, for her upcoming final flight, but to his amazement, chagrin, and disappointment, she strangely refused such help. The China Clipper (NC 14716) was the first of three Martin M-130 four-engine flying boats built for Pan American Airways and was used to inaugurate the first commercial transpacific air service from San Francisco to Manila in November, 1935. On Nov. 29, the airplane reached its destination, Manila, after traveling via Honolulu, Midway Island, Wake Island and Guam, and delivered over 110,000 pieces of mail. The crew for this flight included Edwin C. Musick as pilot and Fred Noonan as navigator. Gray wrote several important articles on the Earhart radio problem that appeared in Bill Prymak’s Amelia Earhart Society Newsletters, including one, “Amelia Didn’t Know Radio.” Which appeared in the November-December 1993 issue of the prestigious U.S. Naval Institute Proceedings magazine. Following is Gray’s poignant reminiscence of Noonan, which appeared in the November 1994 AES Newsletter. It was at Wake Island in August, 1935, that I first met Fred Noonan. I had helped construct the PAA radio communication and direction finding stations there and, at the time, was in charge of them. Fred was the navigator in Capt. Rod Sullivan’s crew, which had brought the first survey flight to Wake, using a Sikorsky S-42 Flying Boat. He was very interested in the radio direction finding and meteorological capabilities of the station and spent considerable time with me and my assistant, viewing and discussing our facilities. I found him to be polite and soft spoken, but very businesslike and obviously very well versed in those matters. Fred also was the navigator of the survey flight to Guam in October. I boarded the plane at Wake on its return trip and flew to Honolulu in it. That was my first flight with Fred. When I reached Alameda I was checked out as Flight Radio Officer. At this time most of the flights being made were for training purposes and I frequently was crewman on flights where Fred was training navigators or pilots. In that way I got to know him quite well. I was not married at the time so had no social contact with him or his wife. As a fellow crew member he was a very fine person with whom to work. I never saw him get excited but he could act very fast when necessary. I recall one night while returning from a long training flight we were making a landing on San Francisco bay through a thin layer of fog, and flew an S-42 right into the water. We hit so hard that the hull was bent till the nose was pointing up about 30 degrees. Almost before I could get straightened up in my seat, Fred was down in the bilges stuffing blankets, pillows and anything else he could find into the cracks of the hull through which the water was pouring. I am sure that had he not acted so swiftly, the plane would have sunk. 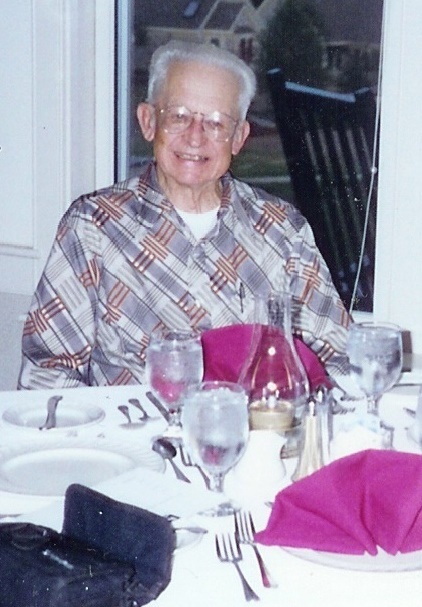 Almon Gray at his Blue Harbor, Maine, home shortly before his death in September 1994. Gray, a Navy Reserve captain and Pan American Airways China Clipper flight officer, flew with Fred Noonan in the 1930s, wrote several astute articles on radio and the final flight and was an important figure in the development of the Marshall Islands landing scenario. While we were laying over at Honolulu or Manila he was pretty much of a loner. If the crew had to make an obligatory appearance as a unit Fred would be there and be sober. However after that he would take off on his own and would not be seen around the hotel again until just before it was time for the crew to leave for the plane. He would be sober but it would be apparent that he had a king sized hangover. Once aboard the plane he would have something to eat and drink some coffee and soon things would be normal. He never, to my knowledge, drank on the plane, or came aboard in such a condition that he could not effectively navigate. The official reports submitted by New Guinea Airways, the outfit that serviced Earhart’s plane at Lae, show that Fred got a time-tick and rechecked his chronometers at 8 a.m. of the day they left Lae. At that time he and Earhart told the Airways people that everything was ready, and set 10 a.m. as their departure time. Fred obviously was sober at 8 a.m. and with all the rush of getting ready to take off he would not have had an opportunity to get drunk before 10 a.m. without someone of the Airways staff knowing about it. Almon Gray passed away on Sept. 26, 1994 in Blue Hill, Maine. In my next post we’ll hear more those who knew Fred Noonan, and perhaps we can come to some well-educated conclusions about Noonan’s reputation as a hard-drinking member of the Golden Age of Aviation. Amy could have learned all of the above from an Associated Press story penned by reporter Eugene Burns and published March 21, 1944, which was then picked the next day up by many papers nationwide including the New York Daily News, New York Sun and Oakland Tribune. The 1944 story, which should have been a blockbuster, made no impression on a nation still locked in the grip of war, with no time to worry about what happened to Amelia Earhart — not much different than our current zeitgeist, come to think of it. After Fred Goerner returned from his first Saipan visit in July 1960, he heard the story of Amelia’s Marshall Islands landing from former Navy men John Mahan, Eugene Bogan, Charles Toole and Bill Bauer, and he presented it to America in his 1966 bestseller, The Search for Amelia Earhart. Readers can find the details there or in “The Marshall Islands Witnesses” chapter of Amelia Earhart: The Truth at Last. Getting back to Amy Otis Earhart: Writing in May 1944 to Neta Snook Southern, Amelia’s first flight instructor, she shared facts and insights she didn’t get from Burns’ AP story of a few months earlier. Beginning with a reference to Marshallese native Elieu Jibambam’s account to Lieutenant Eugene Bogan via the Japanese trader Ajima, Amy launched into what has become a legendary diatribe, and one that emphatically reveals that the so-called “Earhart Mystery” held no such allure for Amelia’s good mother. I present it below, sans a few irrelevant paragraphs, for your edification. I am sorry I have had to be so long in answering your letter — but whenever a new story or rumor about Amelia starts, I am simply lost under the letters that pour in from everywhere. This story came through the Associated Press whose representative here told me they stood ready to vouch for the story, had checked and rechecked on not only the Lieutenant, but had their representative in the south sea area where the native lived, see and talk with him also. The Jap trader who is the weak link in the claim isn’t doing much trading around just now, so whether the story he told the native is really true, or was fact, rumor, or hearsay he was repeating, cannot be checked on now. It does happen to fit in with information brought me by a friend a few days after Amelia’s S.O.S who was listening to a former schoolmate’s short-wave radio when a broadcast from Tokyo came in saying they were celebrating there, with parades, etc. because of Amelia’s rescue or pick up by a Japanese fisherman. That was before the war you know, and evidently the ordinary Jap had no knowledge of their military leaders’ plans so ’were proud of the rescue and expected the world to be. That young girl drove 27 miles at 11 o’clock at night, and through a horrid part of Los Angeles to tell me. It was too late when she arrived at my house in North Hollywood, but the next day I went with her to the Japanese Consulate in Los Angeles and asked him about it. 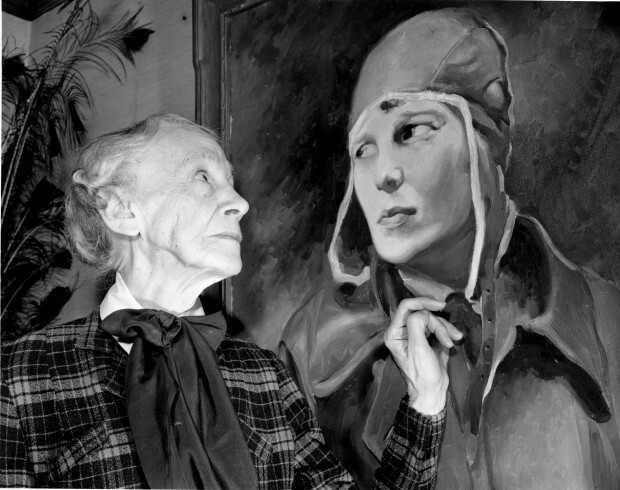 Amelia Earhart began her flying career at the age of 23, when she started taking flying lessons in Long Beach, Calif., from Neta Snook, left, earning her pilot license at the age of 26. Amelia was only the 16th woman to become a licensed pilot. Early in January 1921, Amelia took her father to Kinner Field, a small dirt airstrip in the South Gate area of Los Angeles, and approached Snook. “I’m Amelia and this is my father,” Snook recalled in her 1974 book, I taught Amelia to fly. … “I want to learn to fly and I understand you teach students. … Will you teach me?” Neta and Amelia are pictured above with Amelia’s first plane, a Kinner Airster. He was very pleasant and said he had been out the night before, so ’hadn’t heard the broadcast, and would take it up with the government at once, and it might take time to get the details, and we should come the morning of the second day, when he would tell me all about it, if it wasn’t in the newspapers by that time, and advised us not to tell it about, until we had seen him again. When we went back, a stranger was there — ’said he was the new Consul, had just come in via the boat the day before, and the former Consul had left via the same boat for Tokio [sic] that morning — He knew nothing about it — Mr. Putman came home the next day and finally got in touch the Jap, and not getting any satisfaction over the telephone, insisted on a personal interview and saw the Consul, but got nowhere and came home angry and mad. We tried to get an inquiry made from Washington but could get no further than with the Jap, and they were all stirred up about the search order made for her, and getting that started. The search, when it finally arrived near the islands, were [sic] not permitted, any more than our small boats there, to search the Marshalls, Carolines, or Marianas groups under the Jap mandate, but were told the natives were not friendly, and that the Japs would man boats and search everywhere themselves, and they did, and in some cases received thanks for their cooperation. Many other things have come to me from time to time from people interested and who no more believe she crashed into the sea than I did. I have thought for some time she was being kept a prisoner there, because of what she saw and which they knew would be reported if she didn’t have an accident happen to her, which did to several sent by the government to see if those islands were not being fortified. It all fell together as small pieces came in and makes a story. I have said very little about much that I have gathered and especially about that connected with the Jap prisoner side of it, except to a very few close-lipped friends, not even telling Muriel for I couldn’t check up on it and had no desire to start rumors which would worry Muriel, as it often does me and Amelia’s friends, whom I sometimes think includes most of the world. I am writing this to you because I realize that a great part of your heart is down that way, too, as your boy goes back and forth in his work for his country and know, too, how many the anxious days and hours you keep within yourself as you go about your duties, just as I have tried to do always. One learns to manage the outside, but the inside is something we cannot always do so well with for it takes a lifetime of experience and practice. It does give us something of that understanding heart, which is so sorely needed in the world and which, together with patience, will be a necessity of this new world we dream of making. 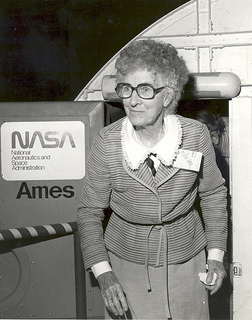 Neta Snook Southern, age 84, emerges from the Flight Simulator for Advanced Aircraft at Ames Research Center, Moffett Field, Calif., sometime in 1980. Neta was the first woman aviator in Iowa, first woman student accepted at the Curtiss Flying School in Virginia, first woman aviator to run her own aviation business and first woman to run a commercial airfield. Yet “Snookie,” as her friends called her, was destined to be remembered for her relationship to Amelia Earhart. Her autobiography I Taught Amelia to Fly aptly captures the essence of her fame; she was forever linked to the Earhart mystique as her first instructor. Neta died in March 1991 at the age of 95. You know, Neta, up to the time the Japs tortured and murdered our brave flyers, I hoped for Amelia’s return; even Pearl Harbor didn’t take it all away, though it might have, had I been there as some of my dear friends were, for I thought of them as civilized. There were times when, inside, I was wild with anxiety as I thought what might be happening to her, but gradually quieted myself with the thought they would (be) more likely to hold her as a hostage, and exchange her for some of their own they wanted, maybe might let her come home after the war was over, well and unharmed, just to show they were not (to) [sic] the brutes we thought them — but, when that story came out from our own men who had seen it all with their own eyes, and afterward escaped from their prison camp to tell of it, I thought so no more. So the hope is only the finding out what happened after the Jap fishing boat picked her up from the small island where she had landed. One can face anything she knows is so, but unless she goes through the torture of not knowing, it is not possible to understand the agony connected with uncertainty, nor the loopholes it leaves for the imagination to get in its work. I often think of the lights kept burning in the windows along the New England coast, here and there, often for a lifetime, put there to guide the fishermen safely home, a goodly number for those who will never come, but uncertainty keeps it burning. One clings to hope or perhaps it is just the feeling she wants the welcoming light, or the sign of the welcoming hand there, while she is here. At any rate, mothers understand it and a good many fathers, too.
. . . This is growing into a booklet, and I must stop. I am glad to hear your mother keeps well, and I think she was not only a patriotic mother not to try the trip out here, but a very wise one. Some of my friends who were here from Boulder, Colorado last week as well as others, tell tales of very uncomfortable times even in the drawing room sleeping cars, and it is impossible to get a reservation on a plane. I hope you keep well yourself, and keep hearing good news from your boy. 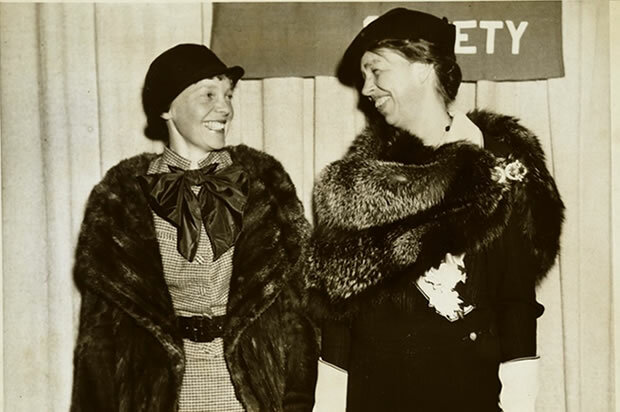 Amelia met Eleanor Roosevelt at a White House state dinner in April 1933, and they were said to have “hit it off” immediately. Near the end of the dinner, Amelia offered to take Eleanor on a private flight that night. Eleanor agreed, and the two women snuck away from the White House (still in evening clothes), commandeered an aircraft and flew from Washington to Baltimore. 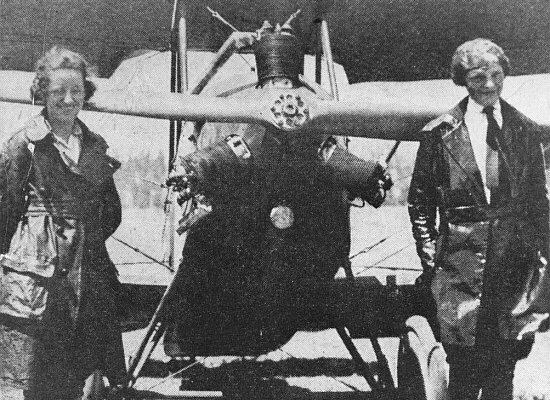 After their nighttime flight, Eleanor got her student permit, and Amelia promised to give her lessons. It never happened. Parchen, who passed away at 85 in 2012, may have nailed it. Eleanor Roosevelt could well have known of Amelia’s death or capture by the Japanese, and if so, it means President Franklin D. Roosevelt knew the truth long before U.S. military forces found Amelia’s Electra in a hangar at Aslito Field on Saipan in the summer of 1944, something many researchers have long suspected. But Amy also made a few very questionable statements in that 1949 Los Angeles Times interview, fanciful claims that couldn’t possibly have originated with Eleanor Roosevelt. Amy’s insistence that she knew Amelia “was permitted to broadcast to Washington from the Marshalls,” and “Amelia’s voice was recognized in the radio broadcast from the Marshalls to the U.S. capital,” seems most unlikely, although Parchen uncritically accepted these statements as true. Strictly from a layman’s perspective, I would think that a short-wave radio transmission powerful enough to reach Washington from the Marshall Islands should have been heard by more than the few who reported hearing messages over several days. And why would the Japanese allow Amelia to broadcast from the Marshalls, only to deny all knowledge of her whereabouts soon thereafter, and later were found to have lied about the role their seaplane tender, Kamoi, played in the initial search effort? Stranger things have happened, I suppose. Many little mysteries can be found when one studies the disappearance of Amelia Earhart. But none of these puzzles can obscure the big picture, the one that so clearly reveals her landing at Mili Atoll and eventual death on Saipan. This is what our media refuse to acknowledge, and so they continue with their endless propaganda that so vexes the few of us who truly care. Amy Otis Earhart passed away at age 92 in 1962 in Medford, Mass., but her 1944 letter to Neta Snook lives forever in Earhart lore as one of the earliest indications that the U.S. government was lying about what happened to Amelia from the earliest days.